If a stylish retreat in a traditional trullo villa, among olive groves with stunning views of the surrounding Italian countryside, appeals, Villa Trullo Grazia is the perfect choice for you! This 1 bedroom villa has a large private pool and extensive terrace, as well as a gazebo perfect for alfresco dining. The 'White City' of Ostuni, famous for the dazzling effect of its whitewashed houses, is only a 15 minute drive away, or 10 minutes further to the coast is the glimmering Adriatic Sea. WiFi, pool heating and air conditioning/heating in the bedrooms are included. The perfect tranquil retreat in a Pugliese countryside within easy reach of the fabulous Ostuni! The large private swimming pool sits on the paved terrace, surrounded by plenty of sunbeds for those wanting to catch some summer sun. A few steps from the pool lead up to a large gazebo made of natural stone and wood, giving the outside of the villa a wonderfully traditional feel. Here you will find the built in BBQ with an adjacent sink and a table with chairs. This is the perfect shaded spot to enjoy appetisers with a glass of prosecco or, light lunches and dinners with a cool drink while admiring the countryside views. The villa is in a countryside location accessed via a lane with fields and dry-stone walls on either side taking you to Villa Trullo Grazia's electric gate. From here a drive leads to a gravelled parking area near the entrance door which opens into the living and dining area. Set under the stone conical trullo roof with natural walls and curved cellings, the open plan living, and dining area is full of character. The lounge is pleasantly furnished with sofas in the alcoves, a flat screen TV and dining table with chairs. With the huge glass door, the room is filled with natural light. Through the hallway there is a further seating area with an ornamental fireplace, great for hiding away with a good book. From here, the adjacent kitchen is fully equipped with everything you need for cooking a delicious Italian meal. The double bedroom is accessed through the kitchen and has a vaulted stone ceiling and a patio door leading to the pool terrace allowing plenty of natural light to flood in. The en suite shower room is contemporary in style with a large walk in shower. There is a seperate shower room adjacent to the kitchen with a washing machine. Villa Trullo Grazia is situated in the picturesque countryside within 15 minutes' drive of the centre of Ostuni, the 'White City'. Ostuni is a flawless city for those who love history and architecture. Explore the churches and narrow streets with balconies flowing with flower baskets. You'll also be within 25 minutes' drive of the coast. The historical towns of Ceglia Messapica and Carovigno are both a 15 minutes' drive away, home to some fantastic places to eat and a chance to experience Pugliese life. All the towns around Villa Trullo Grazia, have a weekly market selling local food, produce, clothes and shoes. The nearest is the open-air market on the edge of Ostuni, open on Saturday mornings selling an abundance of locally produced fruit and vegetables, fashion and ceramics. The centre of town itself has plenty of shops where you can find a souvenir or two. To pick up daily essentials, there's a supermarket around 15 minutes' drive away. There are plenty of opportunities to sample authentic Italian cuisine in the centre of Ostuni. For a lovely evening out, Savelletri on the coast is the best place for good fish restaurants, around 40 minutes' drive away. Alternatively, 30 minutes' drive away, Cisternino and Martina Franca are great choices for local meat dishes. Ceglie Messapica, in the opposite direction from Ostuni is well worth a visit with the main square, Piazza Plebiscito, surrounded by restaurants which serve homemade orecchiette pasta, and gelato with figs and almonds. There are also small bars serving Italian coffee and breakfasts, as well as a few cocktail bars for a pre-dinner drink. Ostuni is well known for its stunning view of the long Adriatic coastline from the historical centre. The beaches are characterised by soft, white sand and dunes. Those closest to Villa Trullo Grazia are Mangiamuso Beach, Quarto di Monte and Rosa Marina, all around 30 minutes' away by car. This part of the coast also offers several beach clubs, where for a fee, you can have a more luxurious experience with quality food and drink served to you as you relax in style! 30 minutes' drive away is the Specchiola Beach with its white, fine sand - perfect for relaxing and sunbathing. Get on board the Ape Calessino, a three-wheeled light vehicle whisking you through the narrow winding lanes of Ostuni - the perfect way to discover Puglia! You can also go up and down the gentle hills of the historical centre of the Valle d'Itria towns or along the coast! The Zoosafari Fasanolandia has plenty to keep you and your family entertained with many attractions, animals, rides and shows. If you would like to discover more, visit the town of Martina Franca only a 30 minutes drive away, with plenty of restaurants, shops and fine Baroque architecture. Alternatively Alberobello town, is famous for conical-roofed houses - trulli which have UNESCO protection. It's a great place to wander around with its narrow pedestrianised streets, little shops selling local produce and souvenirs. For a light lunch or lavish dinner there are lovely cafes and restaurants. Only a 50 minutes' drive away from Villa Grazia. The Golf Course of San Domenico is the most famous course golf of the Puglia, a 40 minutes drive away. A scenic drive along the Adriatic coast will take you to this famous 18- holes course located between the ancient city of Egnathia and the Savelletri Marina. For the kite enthusiasts, Lido Bosco Verde is the perfect place, with a long beach and Mediterranean scrub. After the hard work, the nearby bar and restaurant will help you reenergise. Another option is a visit to the Grotte di Castellana, one of the natural wonders of Puglia which are almost 2 miles long, where you can take a tour around the caves lasting for around 2 hours. 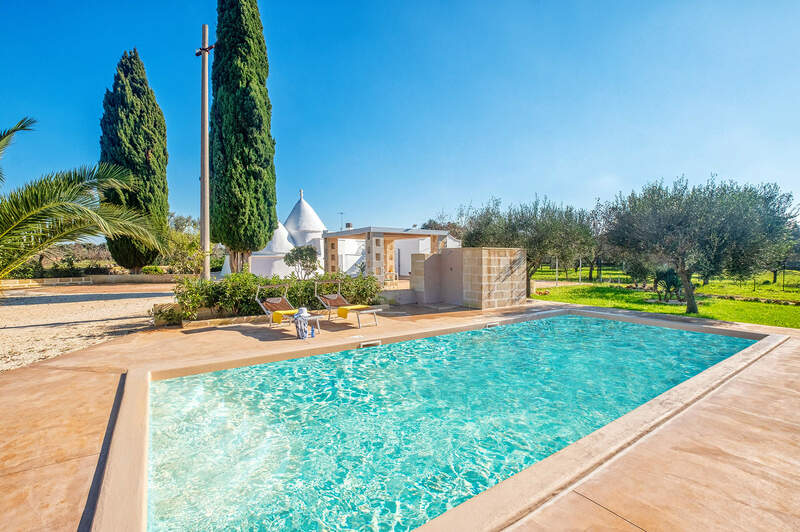 Villa Trullo Grazia is not available to book for season as it is sold out. Take a look here at the Puglia villas that are currently on sale. In Alberobello, the whole family can take a tour of the town and surrounding area by electric bike, Segway or golf buggy with visits to cheese makers or picnic options are available too. It's a lovely, slow-paced way to discover the countryside and rural way of life, unchanged for centuries.